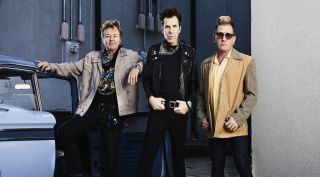 Back in October, legendary rockabilly trio The Stray Cats announced that, in celebration of their 40th anniversary, they would be recording 40, their first new album in 26 years. Now, the band has premiered the wild, animated music video for the album's first single, "Cat Fight (Over A Dog Like Me)." You can check it out below. Set for a May 24 release via Surfdog Records, 40 was recorded in Nashville and produced by Peter Collins (Rush, Bon Jovi, The Brian Setzer Orchestra), with engineering by Vance Powell (Jack White, Chris Stapleton, Arctic Monkeys). You can preorder the album right here. "I love this video," drummer Slim Jim Phantom said. "It's an animation style that combines the best elements of vintage and contemporary into a rockin' joy ride through our song." For more info on the band, head on over to straycats.com.